All glories to the world-wide mission of Srila Bhakti Sundar Govinda Dev-Goswami Maharaj! I offer my humble dandabat pranams to all the devotees. After four days of Harinam Sankirttan resounding loudly throughout Nabadwip, and celebrating the divine Appearance of Sri Gauranga Sundar yesterday, today has been the perfect observance of the Festival of Sri Jagannath Misra. Srila Gurudevs health is quite strong, and he has been incredibly busy receiving guests and giving initiations. This morning he was all smiles as he began receiving visitors just after mangal arati. His Divine Grace attended parts of the aratis, as he has been doing for many days, thus enlivening the hundreds and hundreds of Western and Bengali pilgrims happily residing here for these very memorable days. The area was blessed with just a few raindrops today, the first since weve been here, refreshing the whole Dham. We broke our fast in honour of Mahaprabhus Appearance around 9 oclock, with simple khichuri and papadams, anticipating the huge noon feast. At 10 oclock, Srila Gurudev was utterly delighted with two plays presented by the visiting devotee children under the guidance of Srimati Madhumati Devi Dasi. The first play, Baby Nimai Blesses the Brahmana, entertained beautifully with dear little Premananda acting the part of young, impish Nimai, who continually ate the offerings of a Brahmana, played by Ramananda. Nadia played Sachi Mata who repeatedly carried out the child, and Nilamani played Jagannath Misra who couldnt persuade baby Nimai to refrain from disturbing the Brahmanas puja. Although little Nimai explained to the Brahmana, "You are calling Me and so I am coming," the Brahmana wasnt pacified until Lord Krishna, played by Bimala Nandini, came and explained, secretively, that Nimai is in fact non-different than the Lord of the Brahmanas worship. In the second play, the jovial rascals Jagai and Madhai, endearingly played by bold Devaki Mayi and Krishna Priya, caused havoc for the Sankirttan party of Nityananda Prabhu, played by Nilamani. Michael from Australia played the duos bad accomplice at cards. Vira Chandra played the part of Nimai Pandit, and Chaitanya Das played Sri Haridas Thakur. Nityananda Prabhu and Sri Haridas Thakur and more devotees, played by Ramananda and Premananda, were counselled by Lord Chaitanya to continue trying to help the most sinful Jagai and Madhai. On the second day, when the Sankirttan party returned, Nityananda Prabhu was cruelly hit by a piece of pottery thrown by Jagai. This invoked the apparent wrath of the Lord, who arrived with his Sudarshan chakra to punish the miscreants. Yet, Nityananda Prabhu begged the Lord to show His mercy to them, because that mercy shows the real cause of His advent. Thus, Jagai and Madhai, being pardoned, bowed to all the devotees and took up chanting the Holy Names. Gurudev was fully joyful to see these plays and blessed the children and their parents. 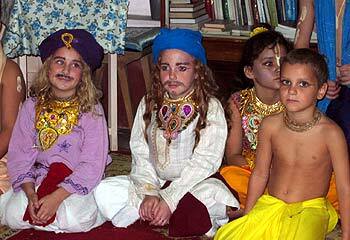 He also told them that they are not from Australia, America, England, etc., but they are Vaisnavas. Finally, he distributed exquisite Russian chocolates to all the players and to the whole audience as well. After continuing to give darshan every waking moment throughout the day, Srila Gurudev engladdened everyone in this Holy Dham by his regular one-hour walks around the Math which usually included parikrama of Sri Govinda Kunda. He walks, then stops in one spot, talks with the devotees and continues his stroll. May that immensely kind Srila Bhakti Sundar Govinda Dev-Goswami Maharaj be pleased to continue bestowing his charming mercy on us!